in my previous post i told u about "how to check whether u are a victim of RAT or NOT ??"" but now in this i will tell u how to backup all ur window registry ?? We all like Installing New Software and Applications without knowing what harm it can do to the Registry in our system. A registry is a Central Storage for all Computer Configuration Data. Why should we backup our registry? Microsoft Windows stores its configuration information in a database called the registry. It’s where programs get information from. In a single statement, one little mistake in your registry can stop Windows from loading at startup. Therefore to protect the PC from getting crashed, we need to have a backup of our registry and restore it at the time of need. For the users that have a useful information on the system, it is advisable to not only take the backup of the data but also of the registry once a week. 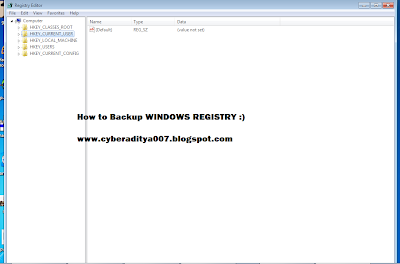 How to Backup the registry? Taking the backup of the complete registry is not a difficult task and takes just about 10 seconds for the whole procedure. Open Run and type “regedit” to open the Registry Editor. To backup the full registry, then click the root key to close all the child subkeys. Click on the File tab and then click on Export. In the Save box, type the name and choose the location to save the registry as a .Reg file. That is it, the exported registry will appear on the system which will be about 10-100 MB size depending upon the data in the system. How to Restore the backup registry? • Double Click on it. A dialog box will open that will ask you if you are sure you wish to add the data to your registry. • The registry will be restored within seconds. So don’t be afraid now if you make any errors in the System Registry.